It’s a snowy Spring day here and I am planning to serve leftovers fantastic chili/soup for dinner. I say, “chili/soup” because you can control the consistency. We like it more soupy, so I simmer it with a lid. If you prefer something thicker, leave the lid off. It’s good either way. 1. Heat olive oil in a large pot, over Medium heat. Add the onions, garlic, chiles, and pepper. Cook and stir until onions soften, about 2-3 minutes. 2. 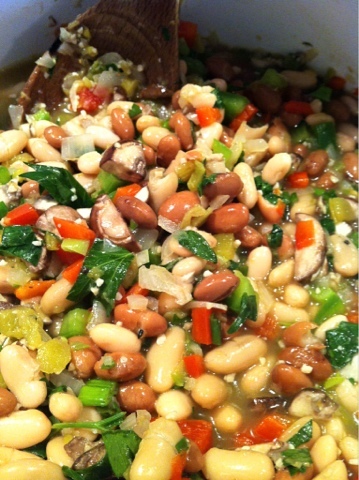 Add the bell peppers, mushrooms, beans, green onions, and parsley. Cook and stir another 1-2 minutes. 3. Add the wine, broth, bouillon, rosemary, thyme, oregano, cumin, and bay leaves. 4. Cover, reduce heat to Low, and allow to simmer, stirring occasionally, for approximately 90 minutes. Adjust seasoning to taste and serve. Serving this with cornbread tonight!